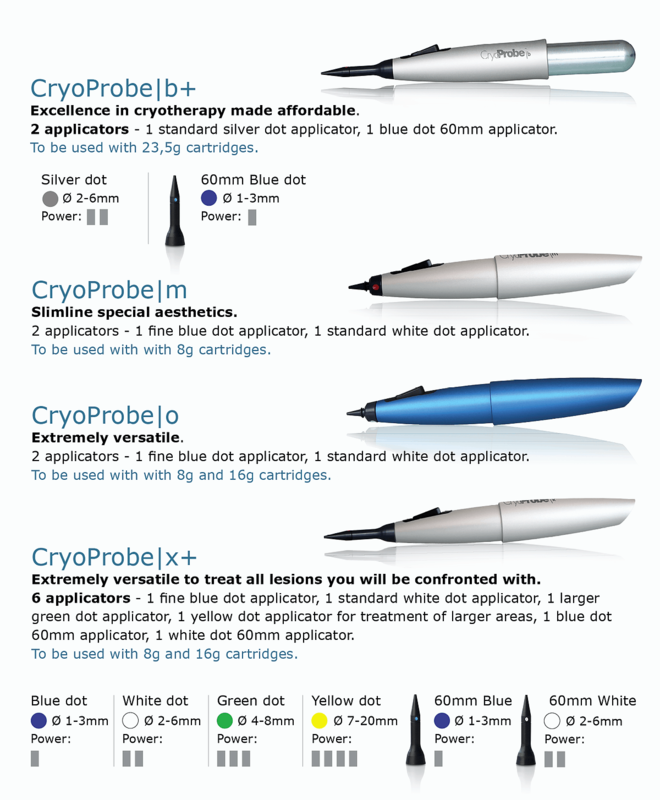 If you’re unsure of which CryoProbe model is best for your practice, you’ve come to the right place. We’ll make this short and concise so you can start performing treatments. As you can see from the graphic, there are 2 major differences between all of the systems: cartridge size and applicator size. The actual size of the cartridge isn’t very important as they all hold the nitrous oxide (N2O) fairly well without leaking. Where cartridge size plays a bigger role is in the size and weight of the pen altogether. For example, the CryoProbe B+ only uses the larger, 23.5-gram cartridges. In order to accommodate the larger cartridge, the housing is larger. This can make the B+ slightly unwieldy when more precise treatments are necessary. On the other hand, the CryoProbe M only uses 8 gram cartridges, so it’s very small and precise. As you can see from the original image, there are 4 different treatment sizes and 2 different lengths. Any tip can be used on any device. The recommendations we make in the comparison image are just that… recommendations. Say you want to purchase a CryoProbe M, but you want to use a green dot applicator. We can make it happen. Give us a call to customize your tips. For most indications, the shorter length applicators are going to work just fine. 2 treatment sizes were made available in the longer, 60mm applicators for those harder to reach areas. We can even take it a step further and add on additional applicators for an additional fee if necessary. For most med spas and dermatologists, the CryoProbe M is going to be the best choice as it’s the smallest and lightest so you can be extremely precise. The tips that come with it can treat all aesthetic indications. Think of the M as your laser beam. Podiatrists and veterinarians can probably get away with the CryoProbe B+. If the M is a laser beam, the B+ is a canon. Gynecologists and urologists should consider the CryoProbe X+ as it comes with every tip size so you’ll have the perfect applicator for every indication. The X+ is going to be your laser beam, your canon, and everything in between! The CryoProbe O is going to be for those who want the versatility of the X+ without paying the larger price tag. It’s essentially the exact same as the X+ but comes with 2 tips instead of 5. If you’re still unsure which system is best for your practice, give us a call at 866.620.9896 and we’ll guide you to the right model. You can also try our CryoProbe FAQ page. Don’t forget to ask us about our trial program!